All the families met up for a post-wedding brunch at our favourite surfer cafe, the excellent Big Vern's. Stretching our legs after a slap-up feed, I spotted this chap, paddling his surf board out to the waves. So what does he do with the paddle when he reaches the waves? let it drag behind him as he surfs in and hit him on the head when he falls off? at least, that's what *I* would do with it! He just carries on paddling. 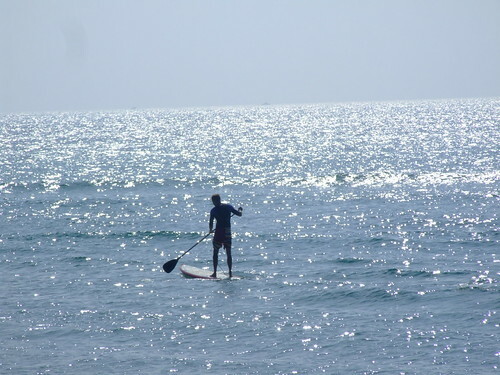 Apparently it's a trendy new sport called "Stand-up paddle surfing".